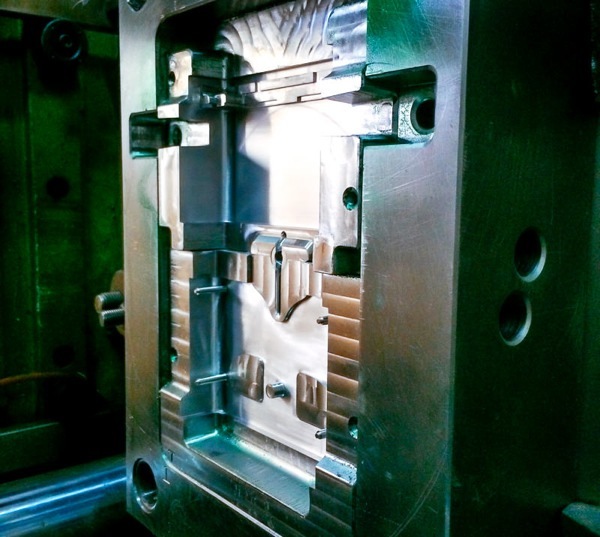 Injection molding “first shot” #manufacturing « Adafruit Industries – Makers, hackers, artists, designers and engineers! I’m in China visiting our factory as we begin production of Poppy, our inexpensive and battery-free gadget that turns your iPhone into a 3D video recording and playback device. We have been working on this for almost a year now, and raised roughly $200K on Kickstarter this past summer, but yesterday was a huge milestone on the journey: we made the first injection molded plastic Poppy, called the “first shot”. Injection molding is a kind of magic. The molds themselves are huge, heavy blocks of steel. The machines look like something out of steam punk science fiction. A bulbous hopper of plastic pellets is suspended over a heating element. Molten plastic is shot into the mold. The plastic cools, the jaws of the mold open, and a robotic arm plucks out the newly minted part. Total elapsed time per part: less than 20 seconds.